Back when I first started planning the railroad, one of my goals was to have prototypically accurate rolling stock. To accomplish this during the 1980's required a lot of kit-bashing. Fortunately, at that time there were a number of very talented modelers who were doing just that and publishing articles about their efforts. I collected all of those articles I could find about kit-bashed rolling stock that would be appropriate for my era (1976). And along the way, I kit-bashed a lot of freight cars. Many of these are dated and a bit crude by today's standards, but they remain some of my favorites. Along the lines of the Wordless Wednesdays, Throw Back Thursdays, and Front End Friday posts, I thought I would start a Freight Car Friday series of posts. Periodically, on a Friday, I'll post pictures and a story about some of the cars I've built over the years. So let's get started. The very first subject of the Freight Car Friday posts is GM&O 47298. There was a picture of a 40' GM&O car that appeared in the August 1979 issue of Model Railroader. It was part of an article on the Fonda, Johnstown and Gloversville Railroad by Harold Russell. The car was spotted on the team track at Johnstown and a group of workers from Karg Brothers was unloading hides onto a truck. It was one of those classic 40' cars that I thought would make a great addition to the railroad. The starting point for the car was an Athearn Blue Box 40' car. 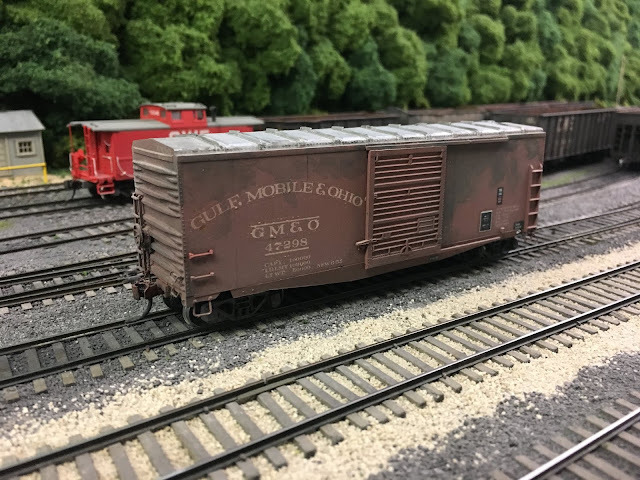 The GM&O car appeared to have the same Dreadnaught end as the Athearn car. Upon closer inspection of the article today, that's exactly what is on the car. However, when I built this car back in 1985, I chose to modify the end per an article by Jim Eager in Railroad Model Craftsman. You can see the modified end in the picture below. The end ladders were removed and new ones added from some long forgotten source. The side ladders were cut down to match the photo and new grab irons were added to the sides and ends. A new side sill was made from styrene to match the prototype. The rivets on the side sills came from old diesel shells. They were sliced off the shells and then added to the sill by placing them in position and applying a small spec of styrene cement. This is one of my favorite tricks from the old days. The stirrup steps are staples. All the remnants of the original door tracks were removed and new ones were fashioned from styrene and Plastruct shapes. 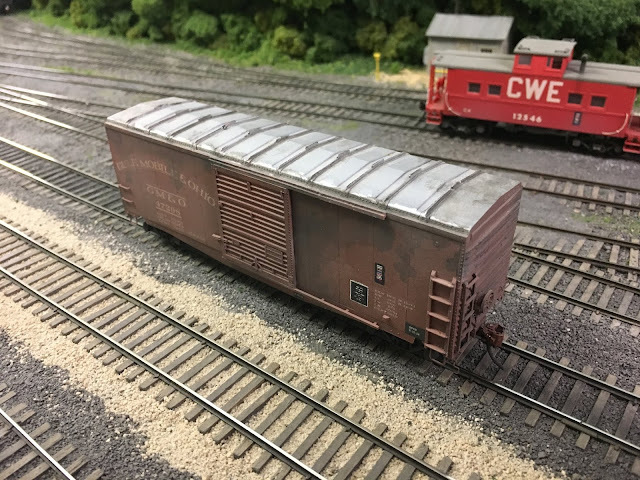 The door is from the old Athearn Railbox kit and while not accurate, it is at least the same width as the prototype. I believe the GM&O decals were made by Champ. Unfortunately, the truck in the original photo blocked the car number and the end of the car was blocked by another boxcar. So I am absolutely certain that the number is wrong. Remember- there was no Internet in 1985 and finding the correct number for this car would have been a herculean task. Prototypically accurate? Not really, and certainly not by today's standards. But it was a fun build and carries enough of that generic, 40' boxcar flavor from the 1970's to meet the "exempt from retirement" standard. Tom, I look forward to this new series of trips down memory lane. I, too, did a bit of bashing back in the day, as well as extensive detailing of locos. For now, that is past due to the wonderful details applied in the Far East and the proliferation of well researched and detailed freight car models. Makes up for having become a "layout builder." Still, your trip to the past is a good reminder of both what we had available then (not much!) and the craftsman skills we developed. As always, good stuff, Tom. And only you would know its defects. The look, the details, and the weathering say "the 70's". It looks right at home on your layout. I'll enjoy seeing more! Modeling fall 1979 this will give me some ideas thanks and keep up the great work.